Deconstruction Pro. provides house demolition services. Deconstruction Pro has experienced experts who know the various In’s and Out’s of demolishing a house, and are also familiar with various state and city laws that govern house demolitions. If you are seeking fast and expert house demolition Deconstruction Pro can help. Why Have a House Demolished? 1. How Much Does House Demolition Cost? House demolition can vary widely in price depending on the size and scope of the demolition project. 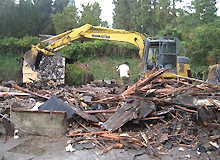 The best way to determine the cost of a house demolition is to call for an estimate. Call Deconstruction Pro Demolition and Disposal, Inc. at (888) 666-8808 to arrange an accurate estimate for your house demolition. 2. Do I Need a Permit to Demolish a House? In almost all cases you will need to pull a permit before demolishing a house. The exact type and kind of permit, or permits, needed to demolish a house will vary depending on both your state and local government. Your city may require additional permits and notifications regarding noise, time of demolition, and debris disposal for a house demolition. Deconstruction Pro Demolition and Disposal, Inc. can assist you in navigating the permitting and notification process for a house demolition. 3. Do I Need to Have My House Inspected Prior to Demolition? Again, the answer depends on the specific state and local laws that govern house demolition, but generally the answer is, Yes. Most states require that a house be inspected for hazardous materials prior to demolition. An inspector checks for presence asbestos, lead paint, and other hazardous materials. If a hazardous material is found a demolition contractor has to follow special abatement procedures to safely clean up and remove the hazardous materials from the house during the demolition process. 4. What Should I Do Before a House Demolition? Prior to demolition recover any reusable or recyclable materials from the house. Most demolition contractors, including Deconstruction, can help you with this process. Before beginning a house demolition make sure you also call your water, power, sewer providers to ensure all services have been disconnected prior to demolition. 5. What Happens to the Debris Leftover from a House Demolition? Debris from a house demolition is hauled away in accordance with your city and state’s regulation governing construction debris removal. 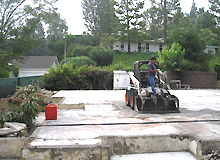 Removing debris means removing everything, including the house’s foundation, and leaving everything ‘down to the dirt’. 6. How Do I Choose a House Demolition Company? 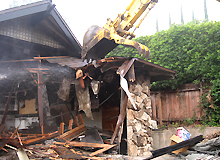 A house demolition is one of the most ambitious and involved demolition jobs a person can ask for. A house demolition entails navigating a sea of paperwork and inspections to make sure its done right. When choosing a house demolition company make sure you choose a company with the expertise to help you navigate these waters. Deconstruction Pro. is an expert in the field of house demolitions and we can help you today. At Deconstruction Pro we consider the landfill our last resort. We have made it our mission and sole business practice to reduce, reuse and recycle absolutely every piece of debris from within our demolition projects. In support of the LEED (Leadership in Energy & Recycling Design) program, Deconstruction Pro is constantly working to create new methods and demolition plans geared towards exceeding a 90% recycling rate. We currently average between 80% and 90% per job. As we actively set new green goals and standards for our company we are not only working to save our clients money, but to preserve the environment as well. Everything from lumber to metals and masonry can all be reused and recycled if the proper action and consideration is taken. If for some reason we cannot find a proper place or purpose for one portion of our job site, we do not just send it to the landfill. We stockpile these materials then work diligently via services such as Craigslist, Ebay, and the good ole fashioned way, word of mouth, to find them a proper home. If going green-demolition is your goal, you’ve come to the right place. When you bring Deconstruction Pro onto the job, you’re not only getting the job done right, you’re doing what’s right for the environment.